Waterbury Clock Co. porcelain clock, "Parlor No. 94", ca 1900. Gilt, bronze, and green decorations. 8 day, half hour strike on a gong, running. 4 1/4 inch ivory dial and decorative bronze center. Rocco cast gilt sash and bezel. 12 inches high. 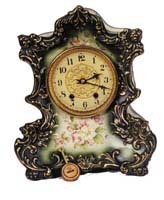 Identical clock to one pictured in Ly-Waterbury No.2054.